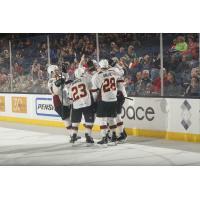 ROSEMONT, IL - The AHL's Cleveland Monsters defeated the Chicago Wolves at Allstate Arena in Rosemont, IL on Friday by a final score of 3-2. With the win, the Monsters improved to 30-26-6-1 overall this season and with 67 points, remain alone in sixth place in the AHL's North Division standings, one point behind the fifth place Utica Comets and three points behind the fourth place Belleville Senators for the division's final playoff spot. The Wolves grabbed a 1-0 lead in the opening frame's final minute when former Monster T.J. Tynan provided an even-strength finish at 19:48 of the period. In the second, Cleveland's Kole Sherwood tied the game just ten seconds into the frame on even-strength feeds from Zac Dalpe and Ryan Collins before Sherwood provided Cleveland with the team's first lead at 7:05 with another five-on-five tally, made possible by assists from Derek Barach and Doyle Somerby. Barach's assist was the first point of his professional career and he followed it up by providing the lone helper on an even-strength Tommy Cross goal for the Monsters at 9:47 that made it 3-1 Cleveland. The Wolves battled back, however, to draw within a goal following a Dylan Coghlan power-play marker at 18:25 of the middle stanza that made it 3-2 Monsters through 40 minutes of play, and after a scoreless final period, Cleveland emerged victorious by that very margin. Monsters goaltender Jean-Francois Berube improved to 20-17-5 this season following a 25-save performance while Chicago's Max Lagace fell to 16-8-4 in net this year by virtue of a 34-save showing. Next up for the Monsters, it's a Saturday road clash vs. the Rockford IceHogs with full coverage, live from BMO Harris Bank Center in Rockford, IL, underway at 7:00 pm on Alt 99.1, AHLTV and the Monsters Hockey Network.